2) Starworks Motorsport’s Mirco Schultis and Renger van der Zande were expected to challenge in PC, but mechanical issues ended their challenge. 3) Extreme Speed Motorsports owner/driver Scott Sharp climbs out as his co-driver Ryan Dalziel gets ready to take over the polesitting No. 1 Honda-ARX03b. 4) Team Seattle’s Mario Farnbacher stands by to relieve Ian James who started the race in the No. 23 Porsche GT America in the GT Daytona class. 5) A crew member for Team Seattle fuels up the No. 23 Porsche GT America during the team’s first pit stop of the day. 6) Jeroen Bleekemolen routine pits the No. 33 Riley Engineering Dodge Viper GT3-R.
7) A rare moment of non-action on the long pit road at the Indianapolis Motor Speedway. 8) Action Express Racing’s Christian Fittipaldi, leads OAK Racing’s Gustavo Yacaman, and Chip Ganassi Racing’s Sage Karam in an early battle for the top spot. AXR and CGR finished 1-2 overall on Friday. 9) Flying Lizard’s Nelson Canache, Jr. outbrakes Paul Dalla Lana of Turner Motorsport to take the lead at the time in GT Daytona, two turns later they came into contact and spun ruining the race for both teams. 10) Frankie Montecalvo goes for a loop at turn one in the No. 52 PR1-Mathiasen car in Prototype Challenge. 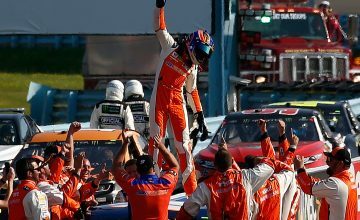 11) After sweeping the front row on Thursday, Extreme Speed Motorsports struggled on Friday in race mode. Johannes van Overbeek (pictured) and his co-driver Ed Brown finished a disappointing 7th on Friday. 12) Action Express’ Joao Barbosa leads the Team Falken Tire Porsche of Wolf Henzler through turns one and two a the Indianapolis Motor Speedway road course. 13) SRT Motorsports’ Jonathan Bomarito salutes the crowd after he and co-driver Kuno Wittmer claimed their team’s first win of 2014 in the GT Le Mans class. 14) Joao Barbosa and Christian Fittipaldi celebrate on the roof of their Action Express Racing Chevrolet Corvette DP after claiming the overall win at Friday’s Brickyard Grand Prix, their second triumph of 2014, but their first since the season opening Rolex 24 at Daytona in January. 15) The Action Express Racing team joins drivers Christian Fittipaldi and Joao Barbosa in victory lane after their overall win in Friday’s Brickyard Grand Prix. 16) Pucker up! SRT Motorsports’ Jonathan Bomarito and Kuno Wittmer kiss the yard of bricks at the start/finish line following their victory in Friday’s Brickyard Grand Prix.